Hello and welcome to WOW! 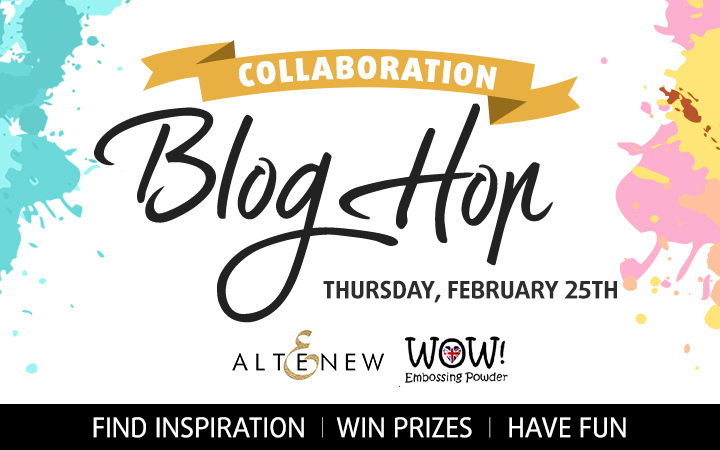 Embossing Powder + Altenew Collaboration Blog Hop! Two creative teams are showing projects made using supplies from these companies and you probably came from Sarah Jackman Reed blog. If not – you may consider starting from the hop beginning, as there are lots of inspiration and chances to win a prize. I’ll be sharing two cards today. For the first one I used WOW! Clear Matt Dull Regular powder. Usually an embossing powder has shiny and glossy finish. Which is not always desirable effect. This one is not, its finish is matt and dull. I personally love this effect a lot. Sometimes we don’t want to have this shine that other embossing powders give. To create this card I first created leaves background using first layers of leaves from Altenew Vintage Flowers, Vintage Roses and Beautiful Day stamps sets, embossed with this powder on a grey cardstock panel. I think it’s a one of the ways to stretch your stamps – using one layer for some background creation. Next I stamped hello from Altenew Super Script stamps set using Warm Sunshine ink and die cut it using set of matching dies. Stamped leaves from Altenew Beautiful Day stamps set using Sea Glass and Ocean Waves inks and hand cut them. Next I started assembling my card. I adhered the panel to white card base, followed by adhering die cut hello and leaves on top. And added some sequins as finishing touches. For the second card I used WOW! Pearl Gold Sparkle powder. 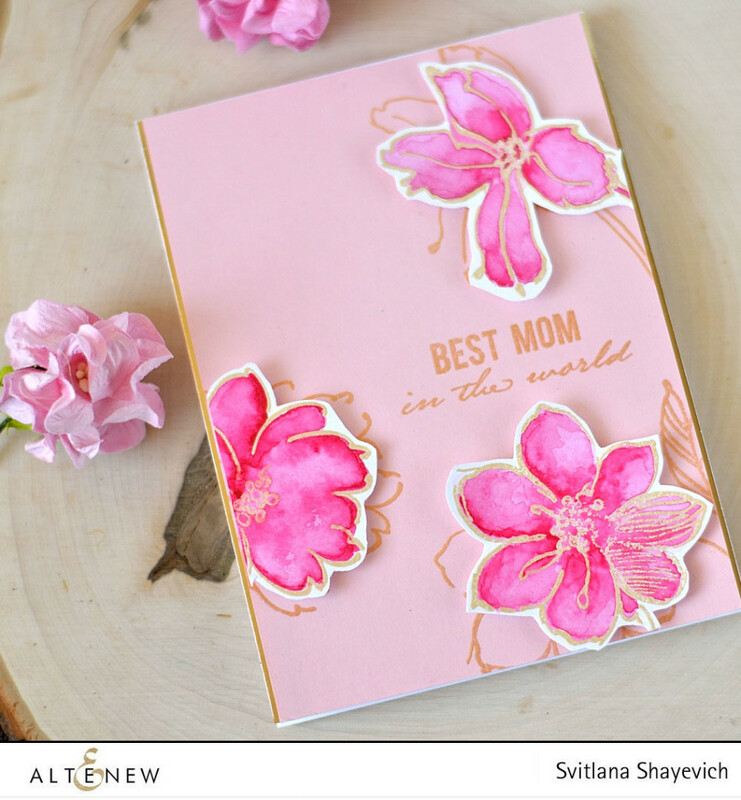 First I embossed some flowers and sentiment from Altenew Wild Hibiscus stamps set on a pink panel. Next – embossed them on Tim Holtz watercolor cardstock and (you will be surprised) watercolor them using my Koi watercolors (or I should say watercolor, as I only use one color here). Hand cut watercolor flowers and adhered them using foam adhesive squares to the panel, offsetting them a bit from embossed images on the panel. There are two $30 WOW! gift certificates and will have giveaways of two $30 Altenew gift certificates up for grabs. Winners will be picked randomly from the comments left on any of the blogs listed below. Comments must be left by Sunday, February 28 23 11:59 EST. Winners will be announced on the WOW! and Altenew blogs on Monday, February 29th. Keep hoping! Your next stop is Fran Westmoreland. Such a classic card that it can be used on a variety of occasions. I have never heard of a dull emboss and now I need to get some adter seeing your beautiful cards! Wow, both are pretty.Never thought we can create such a fun card with leaves alone!! Brilliant.. I love both of your cards. Thanks for sharing your knowlege of matt finish embossing powder. You have created two beautiful cards! Wow, beautiful mum’s day card. 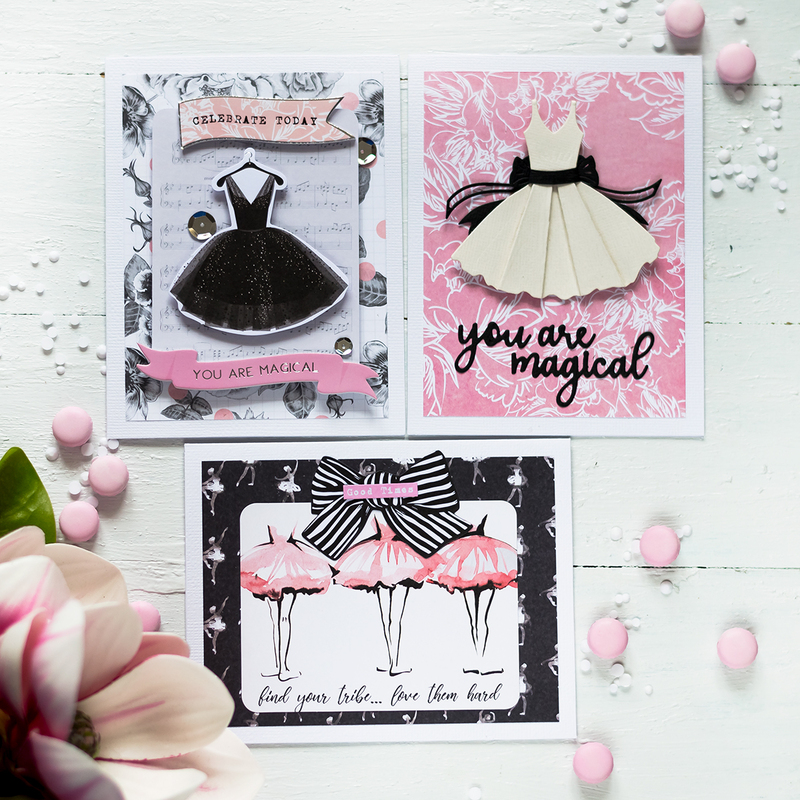 Such pretty cards – you can’t go wrong with Altenew stamps. The WOW embossing powders truly enhance any design. Two beautiful cards. Love the leaves as background. Both cards are lovely, the pink is my favorite! And I have that stamp! Thanks for the inspiration. I like the WOW clear matte powder! Every Altenew Stamp is gorgeous! I have just a few and have many more on my wish list! The WOW powders really make the hibiscus flowers exquisite! And that pink color is to die for. The matt powder is so cool, makes for great texture on a background and your pink card is so pretty! 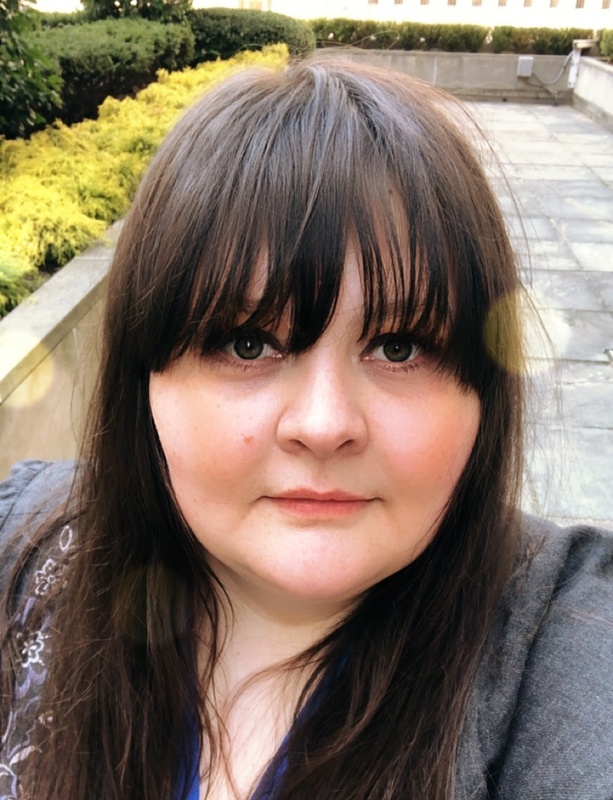 I, as well, had not heard of matte embossing powder and I already went over and placed my order! It leaves such a beautiful effect on your beautiful card. Thank you. I really like the matt powder. I think both your designs are pretty in different ways. Lovely cards. Dull embossing powder is new to me… thanks for sharing. Thanks for introducing me to the matte powder. I am going to have to hunt this down! I am not a fan of pink, but your second card is my favorite. Dimensional flowers and veins of gold. Very nice! I love the shadowing behind the stamped images. That’s a great idea!! LOVE LOVE LOVE! gorgeous coloring on the pink card! Wow! Beautiful cards using fun products. Thanks so much for sharing. Both these really show your talent for color choices and design. They’re amazing and beautiful. Awesome cards and inspiration! Lovin’ the new release and WOW embossing powder! Oooohhhh I just love the bright colors! 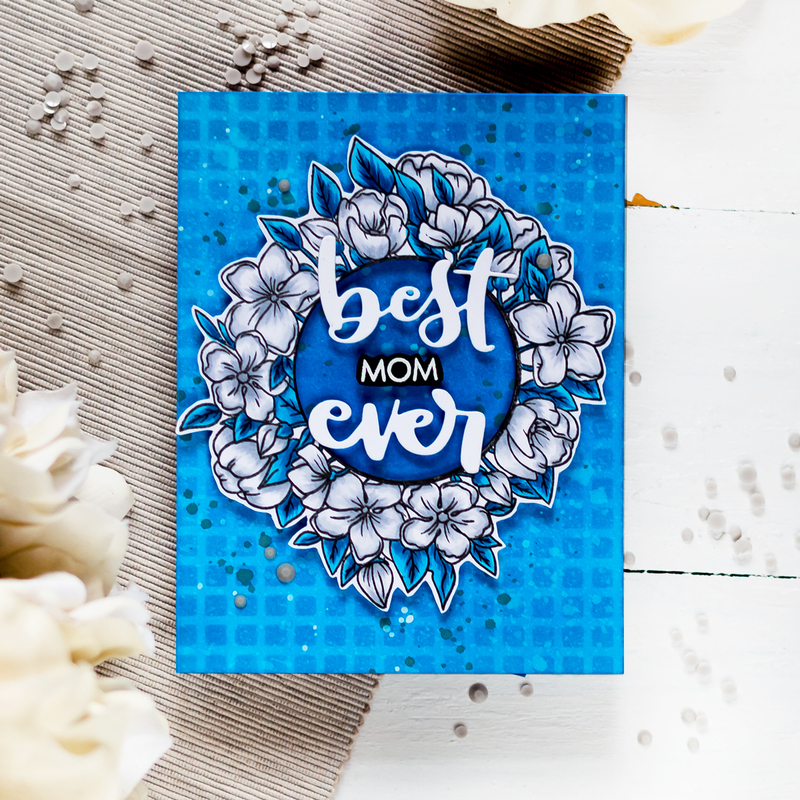 I also love the dimensions you create on the Mom card… that is fantastic! 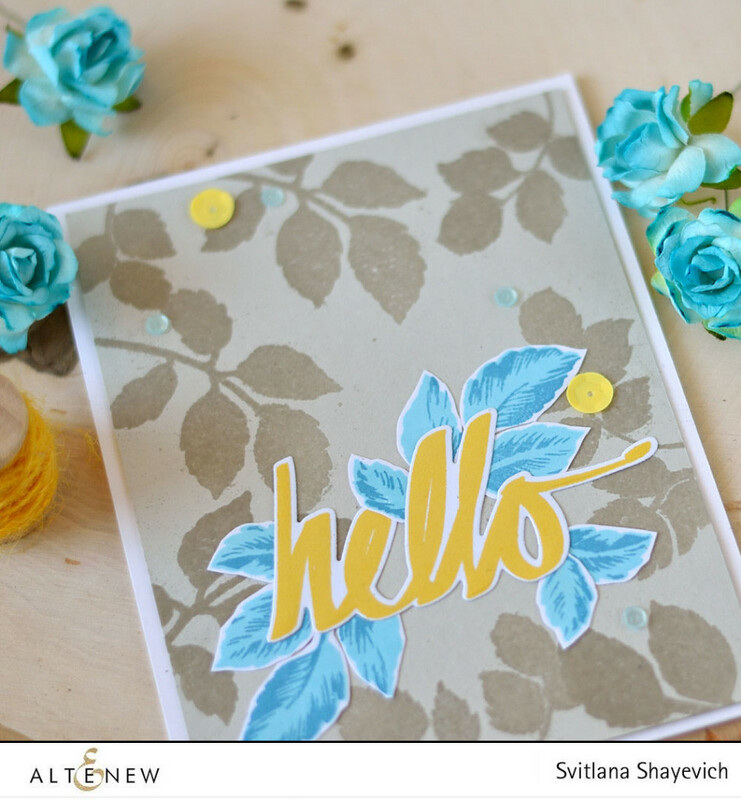 I love Altenew products and Embossing… so this is perfect! Great use of the leaves in your stamp sets. I love cards that use stamp sets in an unusual way. These are great. Love the way the color pops in both of your cards. My fav is the first card as I really like the yellow stamped sentiment and blue leaves. Very pretty. Both of your cards are so gorgeous! The second card is my favourite, I just love the colours you used and the overall effect you created…what Mom wouldn’t love to receive this beautiful card. Thanks for sharing and the great inspiration! Love the cards you created. Especially the pink one. And I really think I need that matt powder. Gosh, the mothers card is so pretty, fresh & floral. Equally like the first with the opaque leaves background. Did you hear me gasping? Thanks for the intro to this clear dull powder – will definitely check it out. Both your cards are so inspiring and stunning! Gorgeous!!!! Beautiful colors! Love the modern look. Thanks for the inspiration! They’re both great! The pink card is especially lovely! 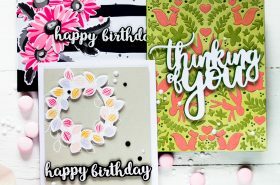 Beautiful cards Svetlana – I didn’t even know a dull embossing powder existed! So beautiful!! Thank you for the inspiration! Such pretty cards! I love the colors! TOtally love the cards… I love the Hibiscus card!!! I love the 2nd card, the pink flowers! So beautiful! I really love that pink card!!! It’s beautiful!! Oh my Svitlana, your cards are amazing! These are both so different and equally stunning!! I love how you used the clear embossing powder. How awesome that you can give the look of darker ink always matching your colored paper. Both cards are beautiful, but I love pink and gold together, it’s my favorite. Thanks for sharing. Beautiful cards and color combos! The pink and gold is my favorite it’s just gorgeous! I need some of these products! I wish the box stores carried these! Thank You for sharing in this awesome hop! Both cards are so different and so gorgeous! 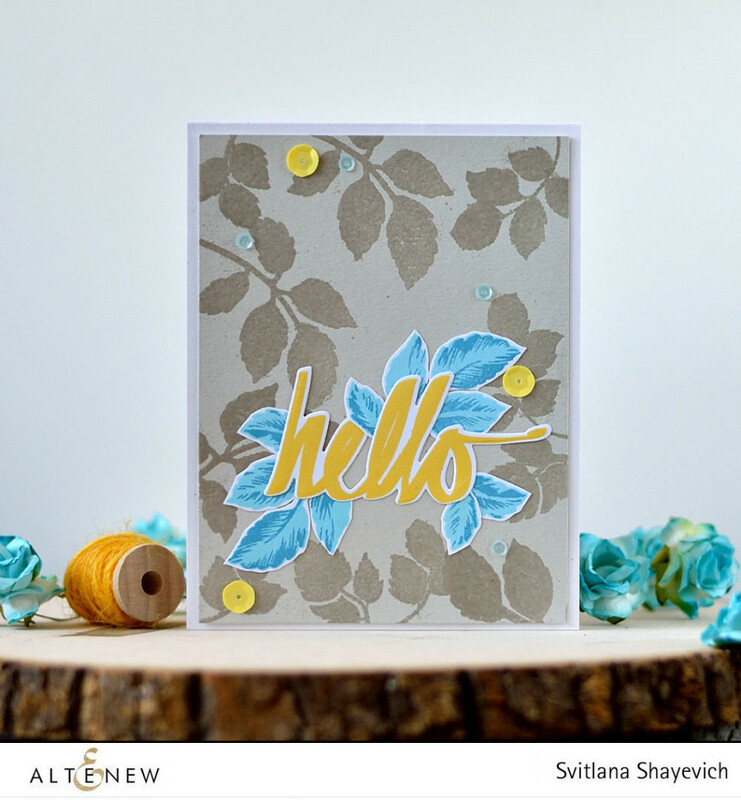 Love the combo of Altenew stamps and Wow! EP. Beautiful card, love your color combo! Awesome cards. I love the matte powder. Awesome stamps and dies along with fabulous embossing! Gorgeous cards! Your pink ‘mom’ card is so lovely! Simply syunning! Thank you for the inspiration! Sveta, lovely cards!!!! And I can see the gold stripes in your second card 😉 Gorgeous! Beautiful cards! Love the simplicity! 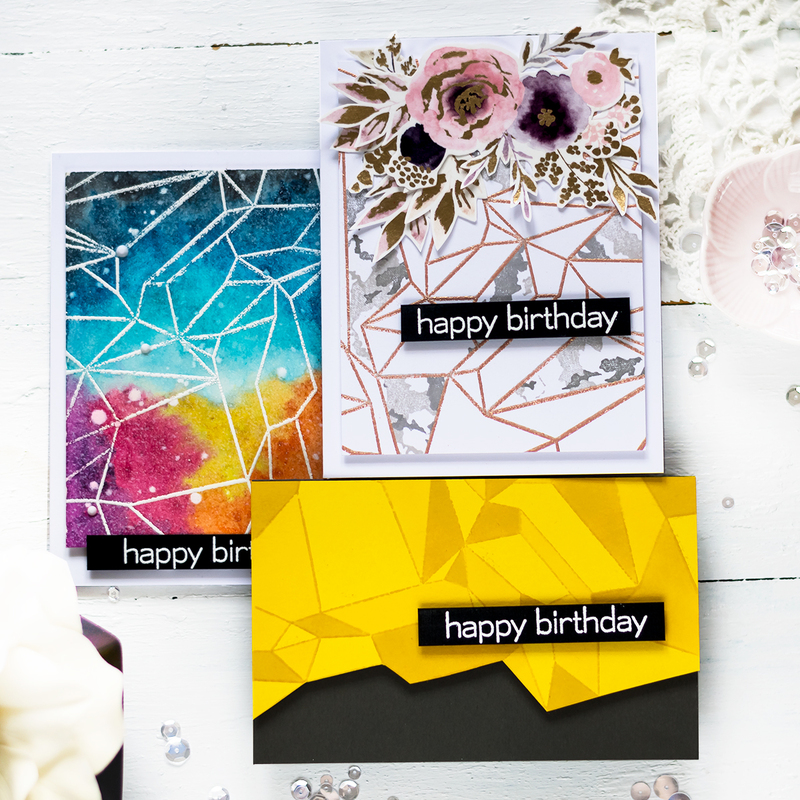 Love the colours you used on both cards – really beautiful! Both card are wonderful designs…but, my heart goes especially to the gorgeous pink one! I have to get out my gold embossing powder to use with flowers! It is such a great look! Love both of your cards, but I think the pink card is my favorite. That pearl gold embossing powder is so lovely! The pink on pink is perfect! Really pretty cards. Love the colors! I love your cards. The first one, with the gray background is so different and pops with the embossed sentiment. Two totally different looks,both stunning! Each so different yet both so lovely! Gorgeous work! What a beautiful card, I have to try that! I love the colors of this card, also this has inspired me. The matte embossing powder was my first introduction to WOW embossing powder and I love it! As much as I love Altenew stamps! Love your card! Gorgeous cards, love the variety of embossing powders, I didnt know you could get matt ones! Very pretty cards. I love your idea of using the embossed stamps as backgrounds. Thanks so much! Both of your cards are stunning!! I love them! I am also a new fan of the matt embossing powder! Thanks for sharing your creations! Wow! I’m glad you didn’t ask us to pick a favorite because I love them both! I never cease to be amazed at the whole range of gorgeous cards that you can make with each set. I am definitely going to pull mine out and start trying all of the beautiful techniques being shown on this hop. Thanks so much for all of the inspiration and thanks too for the chance to win! Love the layering, embossing and overall design! Two cards, two wow!! Congrats! The pink card is such a clever design, beautifully colored too! Beautiful cards!! Love the background you’ve created with the leaf stamps in the first card! 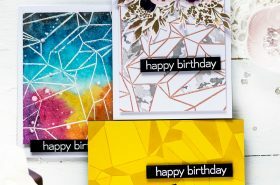 Love the colors you used on your cards! I simply adore the second card! Its stunning! Beautiful cards! I love the colors and layering. Thanks for sharing. Great cards love the blue and the gold on the pink card is so pretty! Nice use of the matte embossing powder on the first card. Love the pink on the second. Nothing better than pink and gold! Both your cards are pretty. Love the color combinations. Both cards are beautiful but the pink one is stunning. Pinks my favorite color. I love that you have made such a beautiful card from just the leaves in this set. Really stunning cards. Both of your cards are beautiful! Especially love the yellow flat embossing vs glossy! My wish list is growing! Beautiful cards. I never knew about dull embossing powder before. Love both beautiful cards, the dull matte embossing is so perfect for the leaf card and the gold pearl is so pretty on the orchids. Both cards are so pretty! The first caught my eye because of the tone on tone background with the bright pop of color. The second is so feminine and I love how you created the gold outlines with the embossing powder. Beautiful cards. Your watercolour is amazing. Thanks for sharing. Stunning cards and love watercoloring and gold sparkle. Love that background on the first card, so pretty and the painting on the second cards is just lovely! Stunning cards, love the bold colors!! Absolutely gorgeous cards! The pink is my fav! Love love love it! Thanks for sharing! Absolutely gorgeous cards! The pink is my fav! Love love love it! I really like both cards. I didn’t know there was a mat embossing powder, so that is nice to know. Beautiful cards….especially like the wild hibiscus! Oh these are very lovely! 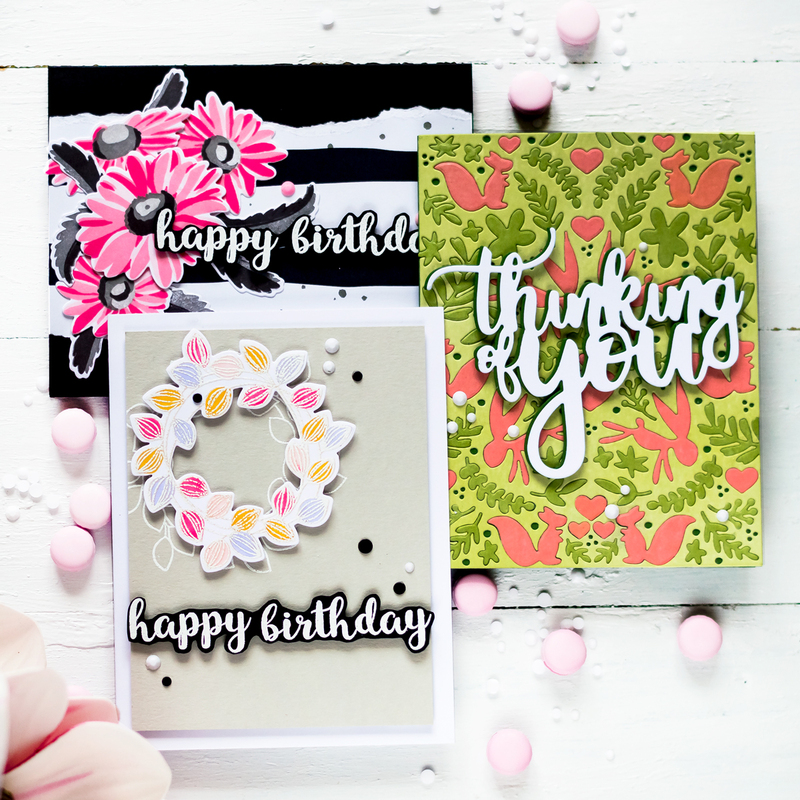 Love your cards–you have such a clean and modern vibe and marry the two products (Altenew and WoW) in gorgeous ways! Beautiful cards Svitlana. Heat embossing adds a really nice and elegant touch to the images. The pink card is amazing… love how bright and pretty it is. Beautiful card! I love the effect of the dull embossing powder. All kinds of ideas floating in my head! Very pretty cards! I like your idea of using the matte finish Wow! embossing powder for your background and the gold powder looks lovely with the pink blooms! Very nice cards! Love the layers & colors on the first card! The second has such pretty pink flowers! Oh, wow, these are fabulous, Svitlana! I think I need that Wild Hibiscus stamp set…. I love how you used it! Clearly this means how even minor difficulties reveal a potential weak spo in enterprise continuity planning. Beautiful cards!!! Such a lovely release! Two absolutely beautiful cards! Thanks for sharing! Your cards are Amazing 😍. The blue leaves card is a stunning colour combo!